It took me several days to get the family room bath shower grouted. My right arm got really sore. But after a few days it was back in shape. 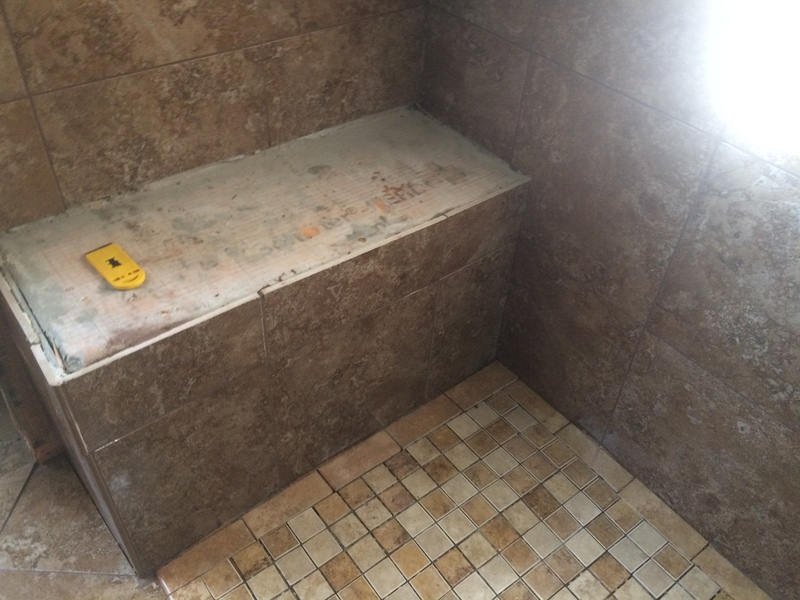 This shower took a lot of grout. I mixed seven batches of the epoxy grout. The batches are each 1/4 of a professional pack. I described measuring and dividing the grout packages when I first started. It is a bit difficult to estimate the correct amount of the colored powder when mixing the grout. 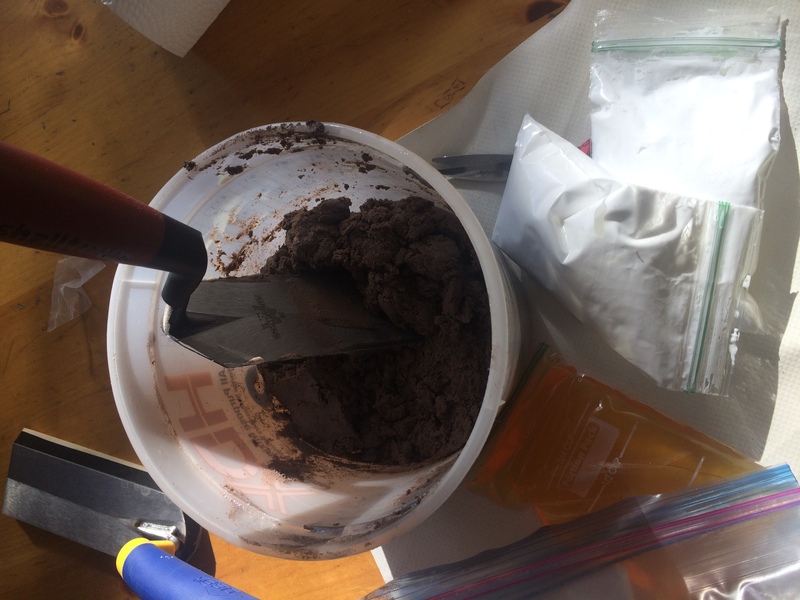 I tried weighing out 2 lbs of the stuff but that tended to make the grout too thick, so I finally just mixed in the powder until the right consistency was achieved. The grout goes on like putty and is pressed into the tile joints. It takes a firm hand on the trowel to get it pressed into place. Then the wet grout is scraped across the joints with the rubber grout float. I bought a handy half sized float for this. It was easier to use than the full size float. Pressing the grout into the mosaic tiles at the rear of the niches was one of the more challenging parts of the job. The grout is washed with a vinegar solution within one hour of mixing it. It typically takes me a little longer to use a batch but the first wash is still not difficult. I used a flat razor blade in a holder and a new 3M white scrubby for each batch. The white is a finer grit than the green pads. I cut each pad into eight sections. Scraping off the grout with a razor is easier than scrubbing when the grout left is thick. Then a couple of hours later a second wash is required with more vinegar. It is important to rinse the sponge often to remove the slightly sticky film that is on the tile. The professional batches come with some powdered wash solution but not enough for the whole kit. I just used it up and then used plain vinegar in water and that worked just as well. I liked doing the difficult parts first and then returning to the field tile. I started above the shower head with the trim tile up there and next grouted the field tile in that space. 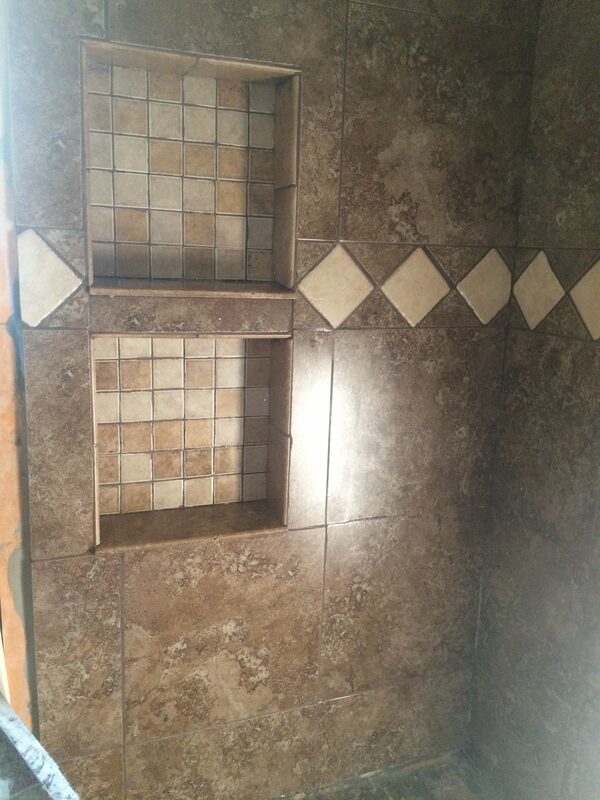 Next was the trim tile surrounding the shower. And the niches were done in two sssions with the trim tile. Then I worked from top to bottom but in sections so that each batch was not all upper tiles. I saved the bench for last. 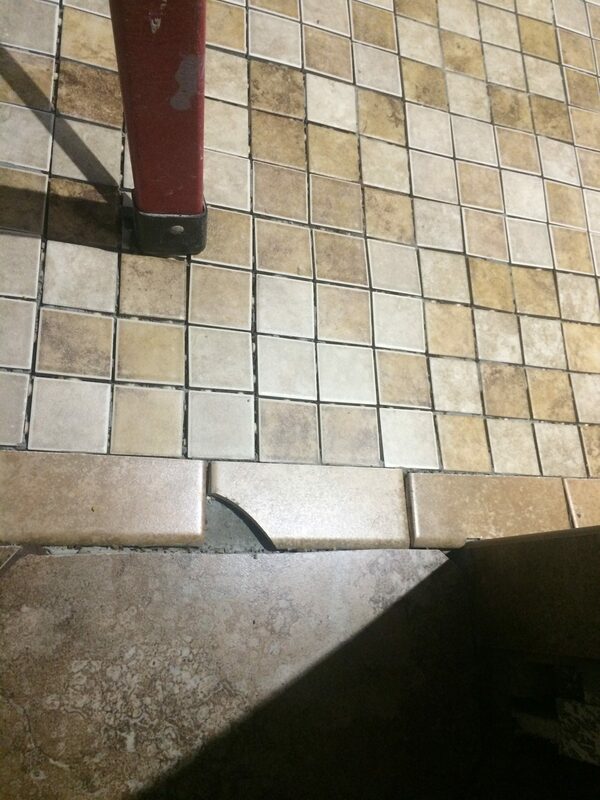 Good thing because I had to cut another corner tile as the one that was installed was short about a half an inch. I also had a double accident with one particular tile. Once I kneeled on it and then I stepped on its replacement. 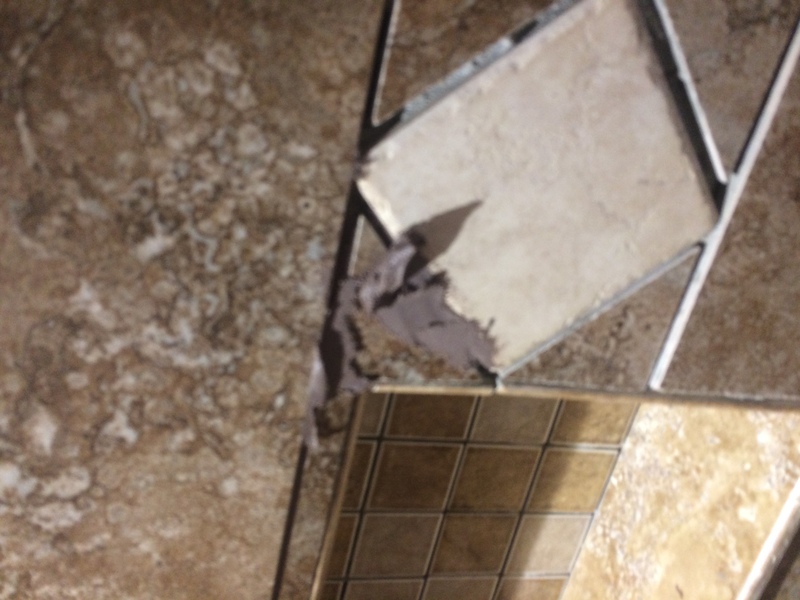 I had to use a non-edge tile here but the edge is buried in this spot where it meets a tile that sticks up a bit too much on the floor. Ah amateur’s work. 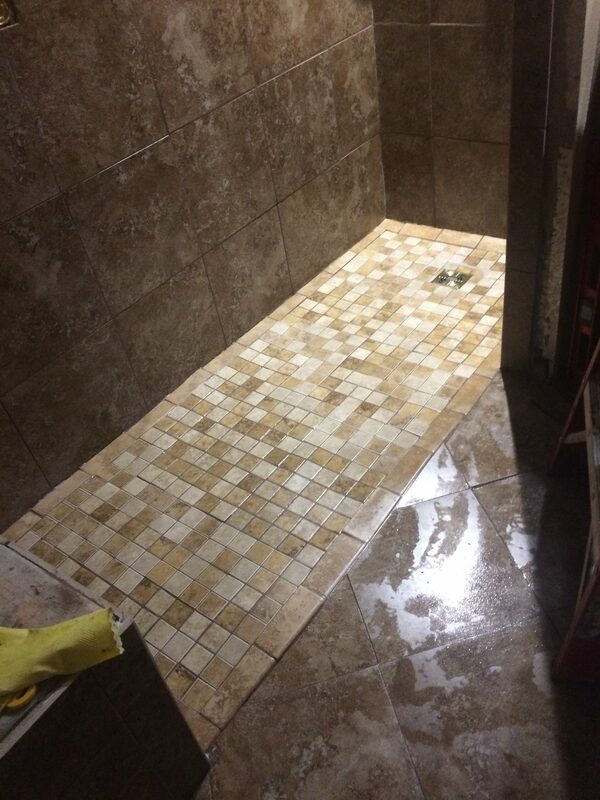 Finally there was a marathon two batch grout job to finish the mosaic tile on the floor. I worked all day from early morning to evening. 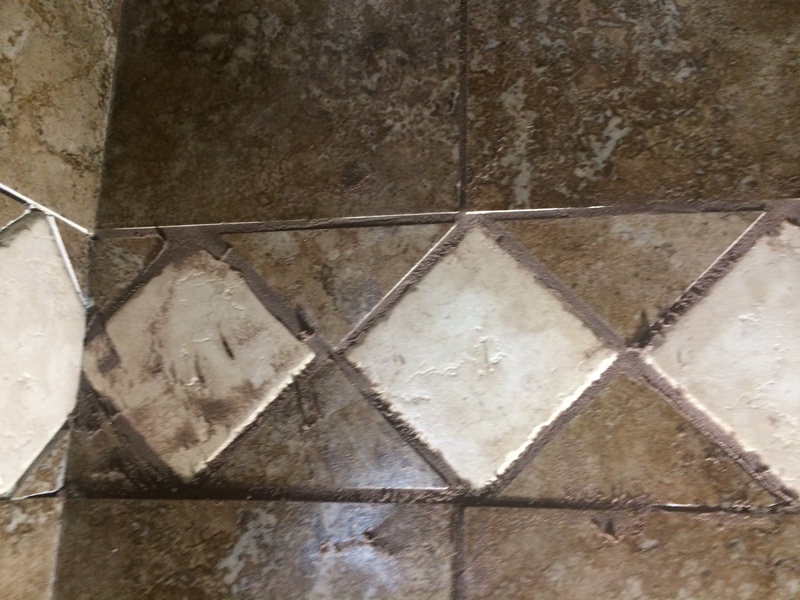 I was so tired when it was time to do the final wash on the second batch that I forgot a little spot that I filled because it was forgotten once before-the top tile under the lower short niche I was able to scrape and scrub the excess grout off the next morning. What next? Set the bench top, caulk the edges, and install the fixtures. Whew. 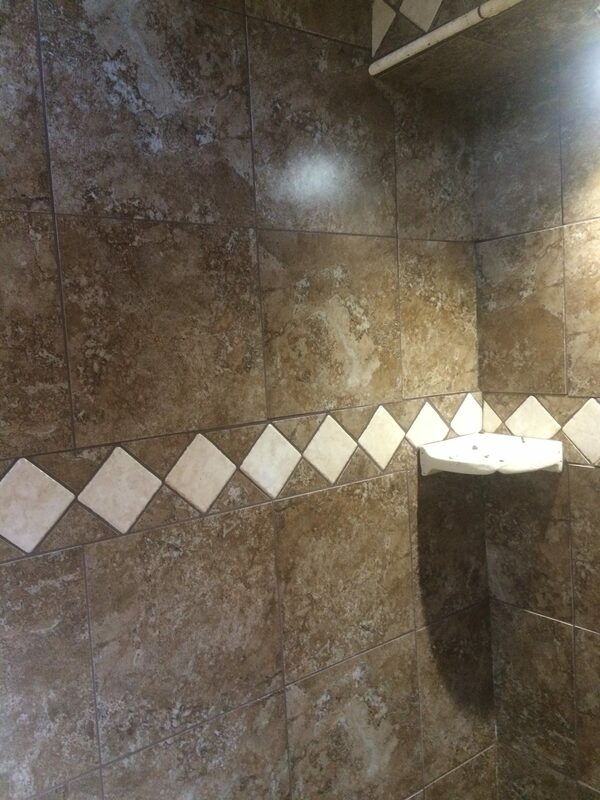 This entry was posted in -Chronological Recent Posts, Bathrooms, Design Style, Tile. Bookmark the permalink.